Wolfs' Books: Does Science Fiction Have A Canon? 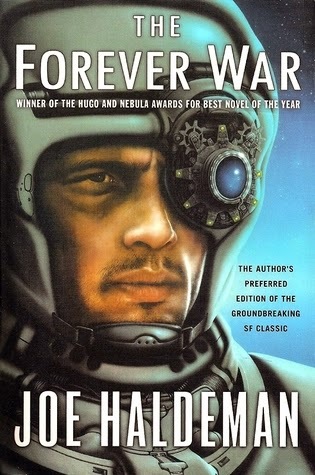 Is there a list of essential science fiction books that all Sci-Fi reader should have read? A canon so to say? I recently read an article about The Benefits of Reading a Book You Don’t Like, I also read a post which was written in response to it. Basically they agreed that, for each field of endeavour, in order to be able to communicate effectively with your colleagues, you need share common experiences or texts. They both said that when you study a subject academically, there are certain texts that you need to be familiar with. For me when I studied Theology, we had to read and study The Bible, the most precise translation of it, and also we had to learn the ancient languages it was written in. And then there were other works by various theologians and philosophers which you needed to be familiar with as well. If not, you missed out on a lot or weren't taken seriously. 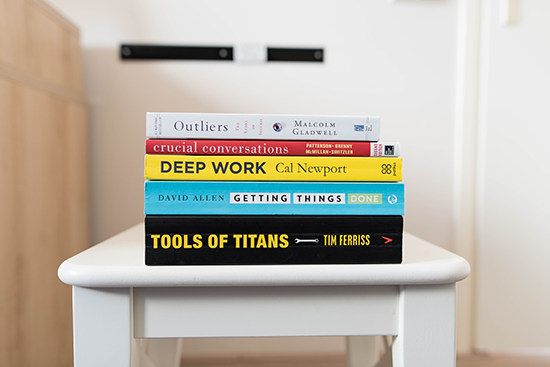 It's the same for students of any other field of study, there are essential texts that you need have to have a grounding in to be part of the discussion. Even in the sciences, and other more technical fields, there are subjects you need to have basic understandings of. For instance, Can a science major skip Biology 101 because it’s ‘not their thing’? Of course not. You cover the canon, or the essential basics of that field, right? And that’s what both these article came up with, for each subject there is a ‘canon’ which you need to be conversant with, or familiar with, in order to relate to your colleagues. Which got me to thinking... Is there a canon for science fiction readers? Does Science Fiction Have A Canon? 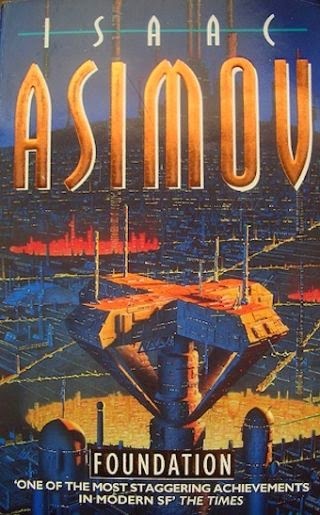 If you’re a Sci-Fi enthusiast, is there a list of books we each should have read at least once in order to share a common experience, have a common bond, with which we can use to interrelate with each other. 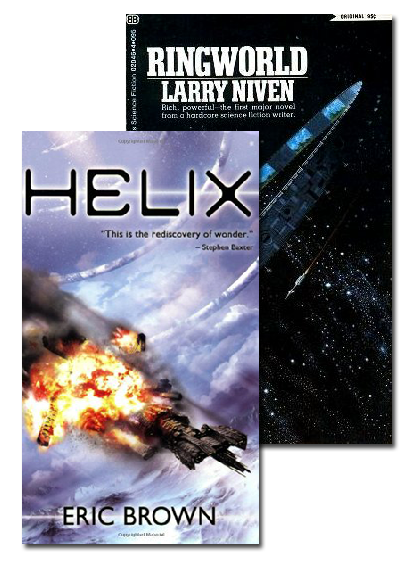 For example: The book Helix by Eric Brown is very similar to Larry Niven’s Ringworld. You may not have heard of the author Eric Brown or his nicely done Helix novel, but at least you now have an idea of what to expect. If you loved Ringworld you’ll love Helix. So after thinking hard about this I’ve come up with a short list of Sci Fi novels which I would consider ‘Canon’. The list includes only books which I have read and that would consider classics. I’d be interested to know what you think, whether there are some I missed or shouldn't have put in. I'm sure there are. 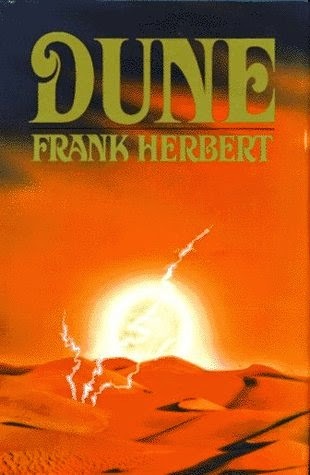 Dune takes place in a feudal society where noble families rule planets in an imperium presided over by Emperor. Computers and robots are banned so it is quite different from many sci-fi novels, as humans expand their consciousness, with the drug\spice Melange, in order to fulfill those niches. This would be a great entry point into Sci-Fi for readers of George R. R. Martin’s A Song of Ice and Fire. Herbert’s Noble Houses of Corrino and Harkonnen are just as scheming and backstabbing as the Lannisters or Boltons are of Westeros. Whereas the Noble House of Atreides are as honorable and chivalrous as the Starks. Another Hugo award winner, Ringworld, is arguably one of the most influential science fiction novels of the past 50 years. It has had a huge impact on our culture as it has helped to generate a multi-billion-dollar industry. The Ringworld planet of the book's title inspired the popular Xbox Halo game series, along with other books like Iain M Banks' Culture series and Alastair Reynolds' House of Suns. This book introduces us to an artificial world of mind boggling proportions, that we need to explore. The Ringworld is similar to a Dyson sphere: but instead of enclosing the entire system, it's a huge, ring-shaped planet that was engineered rather occurring naturally. Instead of being a rock that orbits the sun, the entire orbit is inhabitable. The Ringworld is approximately 3 million times the surface area of the Earth, it provides its own gravity by spinning, it gets energy from the star it orbits, and has walls thousands of miles high at each rim to hold in air. The two human protagonists that are invited to visit and explore this world are thrown in a with a lot of psychotic aliens to get a great tale of exploration. 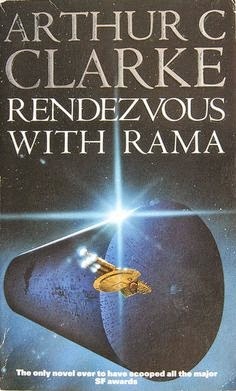 Its a great book for lovers of Star Trek. In 1966, the original Foundation Trilogy won a special Hugo for Best All-Time Series, beating out supposed shoo-in The Lord of the Rings. This book has influenced artists like Douglas Adams and George Lucas. 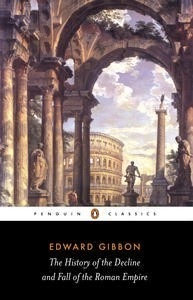 However the book itself was inspired by Edward Gibbon's The History of the Decline and Fall of the Roman Empire. Psychohistorian Hari Seldon predicts the fall of the Galactic Empire and if they continued on as they have been, there would be a dark age of 30 thousand years before a second Empire arises. However, an alternative path allows for the intervening years to be shortened to only one thousand. To do this Seldon needs to collect the most intelligent minds to create a compendium of all human knowledge, entitled Encyclopedia Galactica. A good introduction to Sci-Fi for those who like Tolstoy's War and Peace, and a much smaller book to boot. A huge spaceship turns up at the edge of Earth's solar system, initially it is so large that it is thought to be a meteor and dubbed Rama. Soon they realise it's actually a huge cylindrical spacecraft (54 km long, 20 km in diameter). Naturally, everyone on earth gets quite excited and the nearest spaceship is sent to investigate. It turns out to be a self contained world turned outside in, with a sea that arches above the explorers' heads, apparent cities dotted around the inner circumference and lighting provided by giant trenches in the walls. What follows is a lean and straightforward exploration of what lies within that cylinder – the Rama. The novel's hero William Mandella becomes one of the first batch of recruits sent into the far reaches of space to do battle with a race called The Taurans. For him it is only a two year tour, but because of relativity, or the fact that he's been travelling near the speed of light, a full decade has passed on earth. He can't fit in. Upon arrival home he find the culture has changed, it's too violent and too many customs have changed. So he enlisted for another tour of duty which accentuates his problem. As the world he left behind changes over a millennium, he grapples with the reasons of who and what is he fighting for anymore? This story is most famous for its comedic use of the number 42, a manically depressed robot and various catchphrases – including that popular meme 'Don't panic'. What Terry Pratchett's Discworld novels did for fantasy the Hitchhikers Guide to the Galaxy does for science fiction. It gives it a sense of humour, pokes fun at all the Sci-Fi themes and turns them on their head, it's a book unique in its own right. 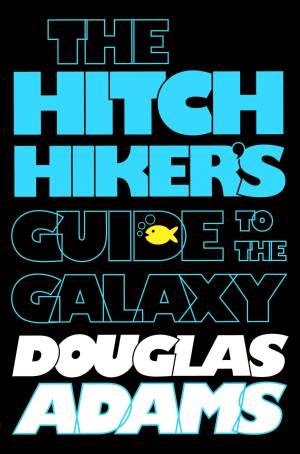 There is some debate as to what extent Hitchhiker's is science fiction, as Adams spent a period writing for Doctor Who, but he also wrote for Monty Python's Flying Circus and in many ways, Hitchhiker's has far more in common with Monty Python than it does Doctor Who. However, if you have someone who is new to Sci-Fi this book may be the entry point for them. There were plenty others that I would like to have added but I think this list can be used as a basis of a good classical canon for Sci-Fi. Well, what do you think? Do you have others you think should be in this list? 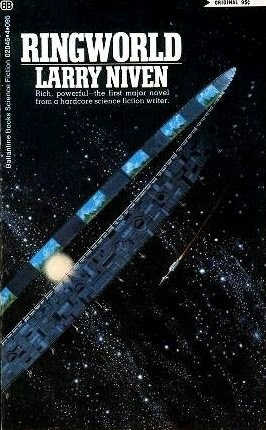 What about a more modern list of ‘essential’ sci-fi novels? I have made a companion video to this post on YouTube. Please feel free to leave comments in the YouTube channel. Let me know your thoughts and recommendations because I’d love to start a discussion on this one…. also because I’m always looking for a good book to read.